Younger Consumers 'Paying The Piper' For Excessive Credit Card Spending. The holiday shopping season is upon us and consumers are ready to "shop 'til they drop." However, younger consumers may find it's time to "pay the piper" for their excessive credit card spending habits, according to a new study released by NFO WorldGroup. Unpaid credit card debt, finance charges and late fees are rapidly accumulating on Visa, MasterCard, American Express and Discover credit card accounts, particularly among consumers under the age of 35. The average balance-carrying consumer in that age group has credit card debt of $3,527, a 48 percent increase from last year, representing almost ten percent of annual gross income. At annual interest percentage rates (APRs) of eleven percent, card debt is costly to consumers in all demographic groups, but finance charges for the under 35 age group average $456 per year, 18 percent higher than for older consumers. More importantly, 58 percent of respondents ages 35 or younger are reluctant to make large purchases in the coming months because of their level of credit card debt. "The majority of the credit card-debt laden group feels reluctant to make larger purchases this season. We expect this will have a dampening effect on holiday spending, particularly for big-ticket items," says Maria Erickson, Executive Vice President, NFO Financial Services. The 16th annual NFO WorldGroup Financial Services Group survey was conducted among 4,100 U.S. consumers between September and November 2002. It reveals that "chronic revolvers," consumers who always carry a balance and usually just pay the minimum payment, grew six percent this year-a direct result of excessive spending. 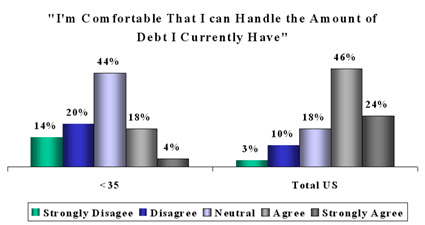 The study also indicates that 33 percent of consumers under the age of 35 are "uncomfortable with my ability to handle the amount of debt I have". 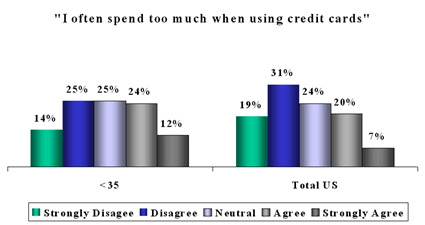 Even more-42 percent-say they "spend too much when using credit cards." Major card issuers are still actively pursuing new accounts with consumers in all age and income groups, including current card customers. The study revealed that the average household receives more than a dozen card solicitations a month. Consumers most recall receiving offers from Citibank, Capital One and Discover. "To gain a larger share of balances and spending, more credit card issuers are striving to put multiple cards in consumers' wallets," Erickson explains. 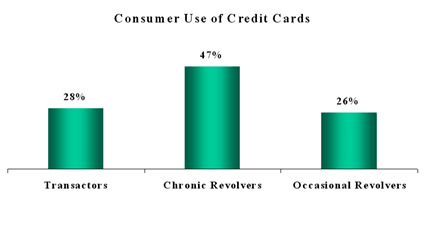 One in four consumers now carries multiple credit cards with different features from the same issuers. Erickson continues, "Providian, Capital One and American Express lead this trend, but each for different reasons. Providian tends to attract consumers with higher credit card debt looking for a lower APR or more credit, while American Express picks up more accounts from current customers with their rewards programs. But for many issuers, a low ongoing fixed interest rate has been the key to obtaining accounts from lucrative customers who don't pay their monthly balances in full." "Companies are using low introductory rates to steal balances from other issuers. The ones that are most successful at recruiting new customers offer introductory interest rates below 2.5 percent. About ten percent of consumers open these accounts and transfer balances to another card when the low rate expires," Erickson says. 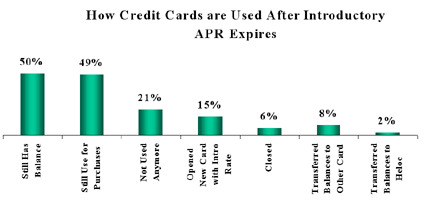 Among consumers who pay off balances, half the time the new card with a low APR goes unused after the rate expires. But about one-half of consumers who transfer high balances to the new card often still have those balances when the card moves to a higher interest rate. To retain new customers, card issuers are extending low rates for longer periods; nearly a quarter of the offers extend the low rate for ten months or more, up from three to six months a year ago. However, only one in five consumers opened one of these new accounts in 2002, and they are largely credit-savvy consumers who usually pay off their monthly balances.